Sc2p peak has significantly split spin-orbit components (Δmetal=4.90eV). Splitting Δ-value varies with chemical state. (e.g., Δoxide=4.3eV for Sc2O3). 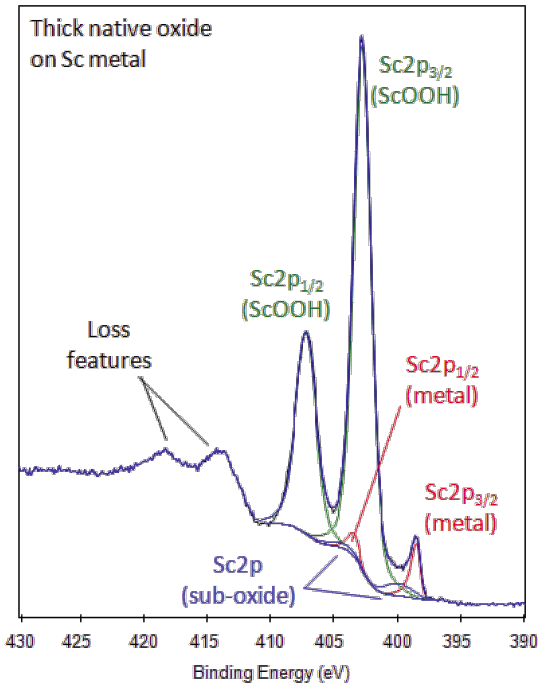 For many elements, the FWHM for each spin-orbit component is the same, but for scandium, the Sc2p1/2 component is broader than the Sc2p3/2 peak. Spectrum below has been assigned according to Ref . 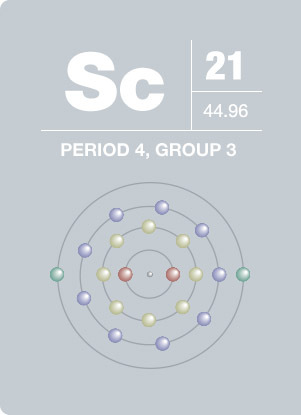 A rare transition element, scandium was discovered in 1878 by L. Nilson in Scandinavia. It occurs in only trace amounts on earth, though it is much more abundant in the sun and other stars. Although scandium can develop a slightly yellow or pink tinge upon exposure to air, it exists in its standard state as a soft, silvery white metal. Scandium’s high melting point and lightweight characteristics make it of interest to the aerospace industry and designers of sports equipment. Current applications of scandium include use in bicycle frames and in the pro- duction of high intensity light when combined with oxygen.